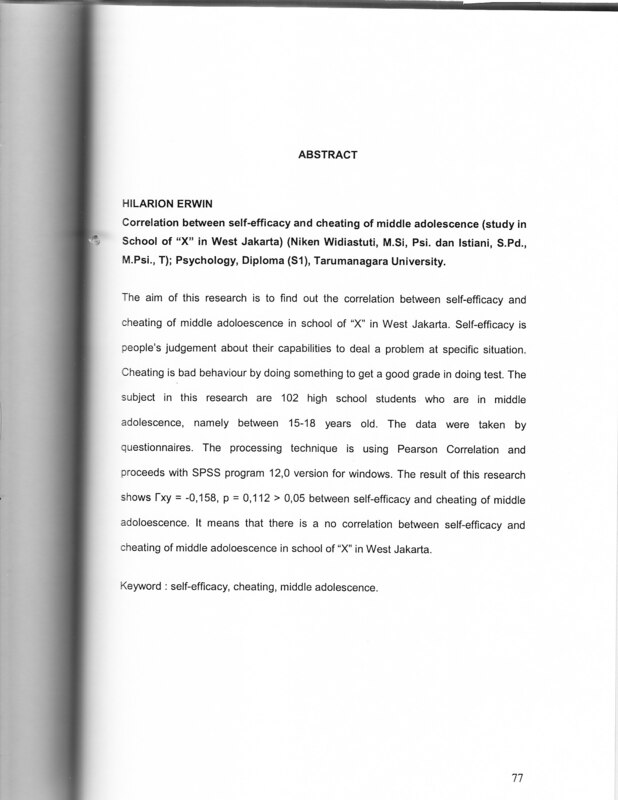 Erwin, Hilarion (2007) Hubungan self efficacy dengan mencontek pada remaja madya. Studi pada sekolah “X” di Jakarta Barat. Skripsi thesis, Universitas Tarumanagara. The aim of this research is to find out the correlation between self-efficacy and cheating of middle adoloescence in school of "X" in West Jakarta. Self-efficacy is people's judgement about their capabilities to deal a problem at specific situation. Cheating is bad behaviour by doing something to get a good grade in doing test. The subject in this research are 102 high school students who are in middle adolescence, namely between 15-18 years old. The data were taken by questionnaires. The processing technique is using Pearson Correlation and proceeds with SPSS program 12,0 version for windows. The result of this research shows rxy = -0,158, p = 0,112 > 0,05 between self-efficacy and cheating of middle adoloescence. It means that there is a no correlation between self-efficacy and cheating of middle adoloescence in school of "X" in West Jakarta.